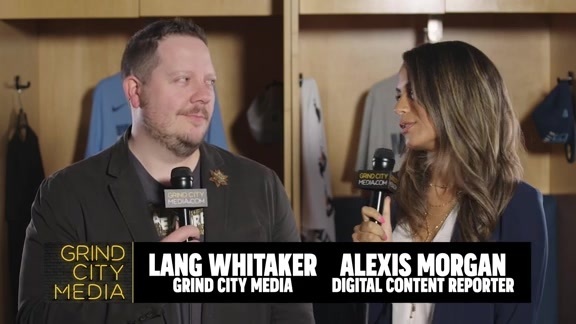 Alexis Morgan and Lang Whitaker recap the Grizzlies matchup with the Pelicans. 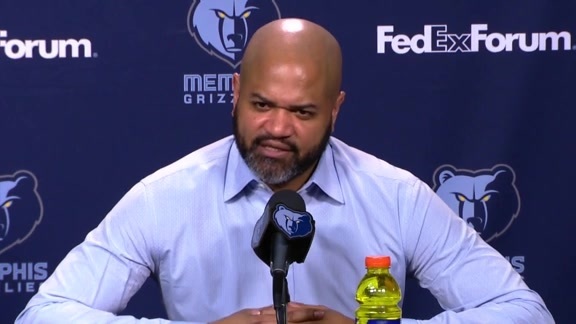 Listen to what coach J.B. Bickerstaff had to say following the Grizzlies match against the Pelicans on Monday night. 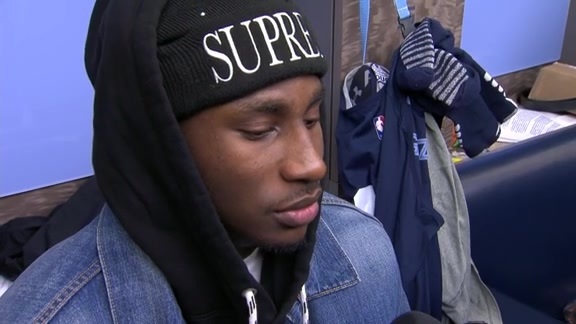 Grizzlies forward-center Jaren Jackson Jr. talks with reporters following Monday’s matchup against the Pelicans. 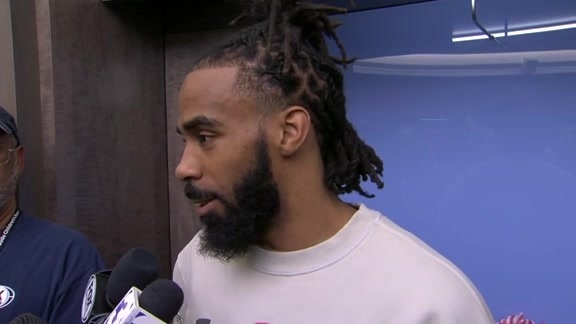 Mike Conley shares his take on what happened during tonight’s game against the Pelicans. Check out all the highlights from tonight’s game against the Pelicans in Memphis. Marc Gasol had 22 points, 8 rebounds, and 6 assists in the Grizzlies’ 85-105 loss in Memphis. 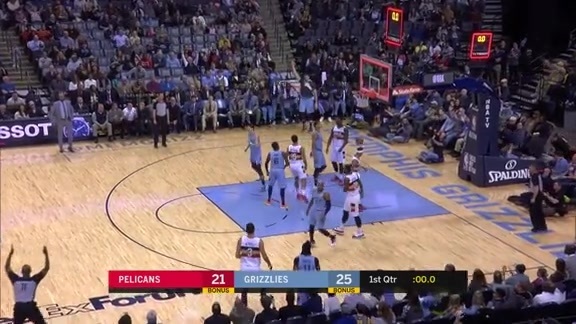 Watch as Garrett Temple sneaks one in from the corner. 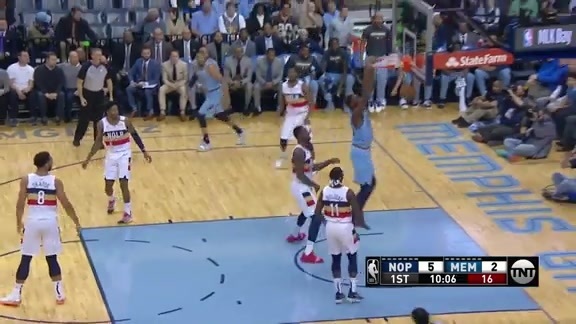 Watch as Justin Holiday makes a fastbreak to the outer line and converts. 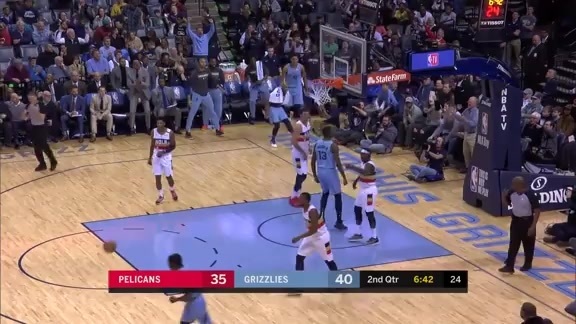 Watch as Jaren Jackson Jr. throws it down with no regard for human life. 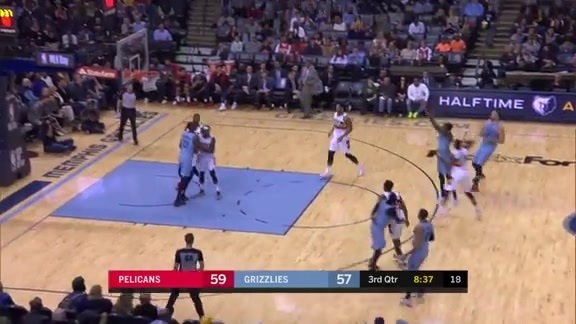 Watch as Mike Conley dances around the perimeter and drops it in as time expires. Watch as Jaren Jackson Jr. goes up high and brings it down hard. After opening the game by shooting 6-for-17 (.353) from the floor and 0-for-7 from three-point range in the first quarter, the Pelicans made 33-of-57 (.579) shots the rest of the way, including going 9-for-19 (.474) from three. The Pelicans went on a 13-1 run (4:45 to 1:24) late in the third quarter to give them their first double-digit lead of the game. New Orleans wouldn’t trail the rest of the way. The Memphis Grizzlies were defeated by New Orleans Pelicans, 105-85, in the annual Martin Luther King Jr. Celebration Game on Monday evening in FedExForum. The Grizzlies fell to 19-28 on the season and are now 12-10 at home. Memphis has lost six-straight games, tying a season-high streak. The Pelicans improved to 22-25 on the year. Marc Gasol led Memphis with 22 points while grabbing eight rebounds and handing out six assists. Gasol has now led Memphis in scoring 11 times this year. Mike Conley added 20 points and a game-high eight assists. Conley has now scored 20 or more points six times in 2019. Jaren Jackson Jr. finished with 14 points. The rookie has now reached double-digits in 10 of 11 games during January. Garrett Temple approached a double-double with nine points and eight boards. New Orleans shot 39-for-74 (.527) overall in the game, and went 9-for-26 (.346) from three. Memphis finished 33-for-88 (.375) from the floor and 9-for-35 (.257) from beyond the arc. The Grizzlies won the turnover battle by forcing the Pelicans into 19 turnovers and scoring 21 points off the giveaways, but New Orleans was more efficient, converting 12 Memphis turnovers into 22 points. The Pelicans outrebounded the Grizzlies 50-35, outscoring them 17-10 on second chances. Memphis, who entered tonight ranked fourth in the NBA in blocks (6.0 bpg), had only one block tonight, matching a season-low (Oct. 27 vs. Phoenix). Jrue Holiday earned his 14th double-double of the season, scoring 21 points and collecting 11 rebounds. Nikola Mirotic also finished with 21 points, making five three-pointers in the game. Julius Randle had 20 points and a game-high 12 rebounds, giving him his 22nd double-double of the year. Jahlil Okafor, who started in place of an injured Anthony Davis, recorded his first double-double since Feb. 25, 2017 at New York, finishing with 20 points and 10 rebounds. It’s the first time this season that four opposing players have each scored at least 20 points, and the first time since Dec. 9, 2017 in Oklahoma City (Abrines, Adams, Anthony, Westbrook). Memphis’ offensive woes continued in the fourth quarter, making just 7-of-24 (1-10 3P) shots for 17 points. 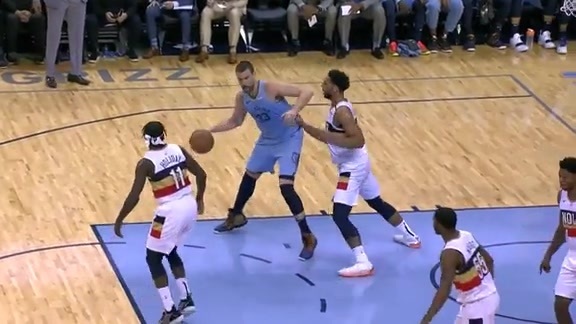 The Grizzlies only turned the ball over twice in the final period, but the Pelicans made a three-pointer off both of them. Memphis grabbed four offensive rebounds while New Orleans had just one, but the Pelicans outscored the Grizzlies 6-0 on second chance points in the final frame. New Orleans’ strong shooting continued after halftime, making 11-of-20 (4-6 3P) shots in the third period. Memphis went cold in the quarter, going just 6-for-21 (2-8 3P) to score 18 points. 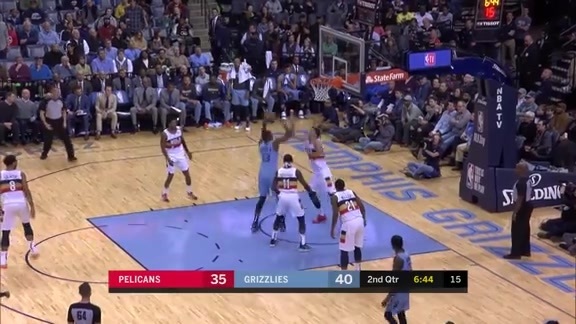 The Grizzlies scored eight points off of nine Pelicans turnovers in the quarter, while New Orleans had 10 points off of five Memphis miscues. The Pelicans went on a 13-1 run (4:45 to 1:24) late in the quarter to help build an 82-68 lead. Memphis shot well in the first half, going 20-for-43 from the field and 6-for-17 (.353) from three, but New Orleans was even better by making 20-of-37 (.541) shots despite only going a season-low 1-for-12 (.083) from long distance in the half. The Pelicans’ 8.3 three-point percentage during the first half was the lowest by an opponent this season. Memphis committed only five turnovers (six Pelicans points) in the half, while New Orleans had seven (eight Grizzlies points). The Pelicans scored 30 of their 54 first-half points in the paint, while the Grizzlies scored 22 points inside. Conley led Memphis in the first half with 15 points on 5-of-7 (3-4 3P) shooting. The Grizzlies offense opened the game with an efficient 10-for-20 (.500) shooting in the first quarter, including going 5-for-11 (.455) from three-point range. 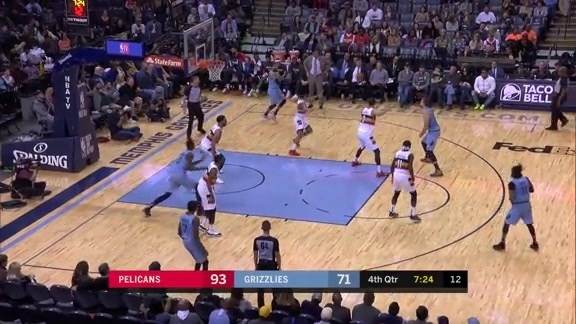 The Pelicans chose to work in the lane, with all six field goals scored inside to outscore the Grizzlies 12-4 in the paint. New Orleans missed all seven three-pointers in the first quarter, but connected on 9-of-10 (.900) free throws. Conley hit a 27-footer as time expired in the quarter to put the Grizzlies up 28-21. New Orleans continued to struggle behind the arc in the second quarter, making just 1-of-5 (.200) threes, but made 14-of-20 (.700) shots overall. Memphis shot 10-for-23 (.435) from the field, making 1-of-6 (.167) treys. The Pelicans outrebounded the Grizzlies 11-6 in the quarter, and both teams scored 18 points in the paint. Memphis went on a 9-2 run from 7:48 to 5:19, highlighted by a one-hand jam from Jackson Jr., but Okafor and Holiday both scored in double-digits in the quarter to lead 54-50 at halftime. 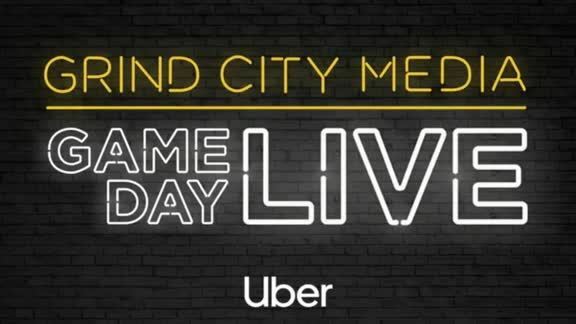 The Grizzlies will face the Charlotte Hornets for the first time this season on Wednesday, January 23 in FedExForum at 7 p.m. CT. Come out to the game, tune in to FOX Sports Southeast presented by Pinnacle Financial Partners or listen on 92.9 FM ESPN to follow the action. My emotional state is steady. We’ve got to do a better job as coaches of maintaining our guys’ spirit. I think that is the difficult piece: in those moments, again because of what has happened the past six weeks, we’re kind of beat and we allow one play to impact the next play and then it impacts the next play. The next thing you know, it’s one of those runs that are happening. So, we’ve got two options the only way we see it: you fight or you run. Tomorrow we will show up; we’ll go to work. Wednesday we will show up, and go to work. That is the only approach that we can take. That is the only way that we improve as a team. It’s the only way we feel better about ourselves; you put in the work. And you trust that the work will lead to some of the results that you want. That’s the only option we’ve got. No – all losses hurt the same. We’ve got to answer the bell. We’ve got to fix the third quarter issues. That’s the approach that we take. It’s not that one is bigger or one is larger. (There’s) not finger pointing. It’s fix the problem, and all of us, collectively, have to stay in that mindset. Whatever the issue is: fix it. Another issue comes up? Fix it. It’s as simple as that. But the time has to be spent. The energy has to be spent to do that. I think it’s an honor to play on this day. It’s an honor to celebrate the legacy of Dr. Martin Luther King (Jr.). Like I said beforehand, all of us would not be able to sit in this room with one another to have this discussion. I wouldn’t be able to have the job that I have. The fans wouldn’t be able to sit amongst one another and celebrate and cheer together with a common goal. We all know the history with the city of Memphis and how important this game is to the organization. So, it’s an honor and privilege to be a part of it. We go back, we watch the film. We have conversations about different things that we do in practice: all those things. We’ve just got to get the job done, no ifs, ands or buts about it. All of us have to assume responsibility and know the situation that we are in . . . We’ve got to execute our assignments over and over and over again. We preach it: the responsibility is what is now. The responsibility is not what happened the play before or what we think might happen the next two possessions. So every single possession I have a responsibility. And if each individual carries out their responsibility and their assignment, those end up being good possessions. The more good possessions you put together, the better the results. So that is where we have to be and that has to be our focus. We have to be small-minded, with a singular focus when it comes to those moments and understand what is happening. And then how do we fix it? We fix it with five guys taking care of their responsibility. It means a lot, for the city of Memphis especially. The history that goes along with (the day), and everybody in attendance was aware of it. Especially having a home game, it makes a statement that we are all together, we are all as one, this is bigger than basketball. We rock together. It’s not like there’s one person. We are all leaning on each other. But my family is always there as a support base. Everybody has their own family. It comes full circle; it’s a family environment here anyway. I don’t know. It’s a long game; that’s no excuse. But it’s just obvious when you look at the numbers, we have to come back harder in the third quarter, make better plays and decisions and take better shots. We can’t let leads blow out right there. Man, it’s really embarrassing. On a day like today, I think [this day] is really special for all of us, very special for the city. And for us to play the way that we did, especially in the second half, is unacceptable. And nobody’s going to come and save us. We have nobody coming in the door tomorrow that’s going to change what we’re doing. We’ve got guys down. We’ve got eight, nine, ten guys that can suit up. We need everybody to find it in themselves to get us out of this thing. Today was not us. We’ve got to find a way to change our mindset, you know. We’ve got to believe again, more so than anything. We’ve had the same group of guys that was here before, here when we were 12-5. Lineup hasn’t changed that much. Guys are still playing who were playing then. It’s about our confidence. It’s about guys understanding that we can win the game, regardless of runs. Being down nine, ten points in games – we used to fight through that. Right now we kind of hold our head and feel like the game is over once they make two threes in a row or we turn the ball over. We’ve got to keep encouraging each other, keep working in practice. But like I said, there’s no formula, there’s nobody coming in the door that’s going to make a difference overnight. We’ve got to do this ourselves. We give effort. It’s consistent. We play really hard, we practice really hard. We’ve got great guys in the locker room. You know, sometimes, some nights you don’t have enough talent to beat another team, but we haven’t given ourselves those chances to show that. To feel like when we lost a game, we gave everything we had, every single guy. Some games, some guys do better than other games, but we need everybody to give that same fight every single night in order to give ourselves a chance. And like I said, we’ve got guys down, guys hurt, away from the team. A unique situation. So we’ve just got to fight through it. The Pelicans went 1-for-12 (.083) from three-point range in the first half, the lowest three-point percentage in a half by a Grizzlies opponent this season. The Grizzlies won the turnover battle by forcing the Pelicans into 19 turnovers and scoring 21 points off the giveaways, but New Orleans was more efficient, converting 12 Memphis turnovers into 22 points. New Orleans outrebounded the Grizzlies 50-35, outscoring them 17-10 on second chances. Four players scored at least 20 points for the Pelicans, marking the first time this season that four opposing players have each scored at least 20 points against Memphis, and the first time since Dec. 9, 2017 in Oklahoma City (Abrines, Adams, Anthony, Westbrook). Memphis, who entered tonight ranked fourth in the NBA in blocks (6.0 bpg), had only one block tonight, matching a season-low (Oct. 27 vs. Phoenix). Marc Gasol led Memphis with 22 points while grabbing eight rebounds and handing out six assists. Gasol has now led Memphis in scoring 11 times this year. Mike Conley added 20 points and a game-high eight assists. Conley has now scored 20 or more points six times in 2019. Jaren Jackson Jr. finished with 14 points. The rookie has now reached double-digits in 10 of 11 games during January. Garrett Temple approached a double-double with nine points and eight boards. Jrue Holiday earned his 14th double-double of the season, scoring 21 points and collecting 11 rebounds. Jahlil Okafor, who started in place of an injured Anthony Davis, recorded his first double-double since Feb. 25, 2017 at New York, finishing with 20 points and 10 rebounds.